‘Elegance is Refusal’ has long been one of my favorite quotes—first uttered by Coco Chanel, later appropriated by Diana Vreeland, I repeated it often through the last two decades of excess, as I saw too many buildings and landscapes, perfect in themselves, altered and renovated beyond reason by people who simply could not resist the human temptation to ‘improve’—add a bit of shrubbery here, add a great room there—for whatever reasons: to mark something with an manufactured idea of comfort and status. Restraint, suitability and understatement have been sadly missing from the dialogue. It it not far fetched, as such properties have gone in recent years, to suppose that the new owner will either renovate the farmhouse—which I like to imagine with curtainless windows, painted floors and simple scrubbed furniture, sea glass collected from the beach laid out on windowsills to catch the light—adding the usual overscaled, over-windowed ‘barn’ room with super-kitchen, or perhaps build a new cottage, no doubt in a painfully overworked shingle style reproduction on the ‘excellent potential building site near the shore’. My family has a tiny cottage on the beach on a peninsula near here. The peninsula was pure magic in the summer. The landscape was entirely made up of such farms, lovingly and simply kept, some by summer families, some still hardscrabble farmed by the families who had long owned them….old stone walls, meadows to the ocean, hedgerows of steeplebush and fragrant wild roses constituted the landscape. One by one these breathtaking properties are being broken up for smaller summer properties. The formula almost never varies: a section of field or wood is leveled, a driveway with gateposts is built, a square of lawn is created, and a very suburban house is plopped in the middle, usually landscaped within an inch of its life. 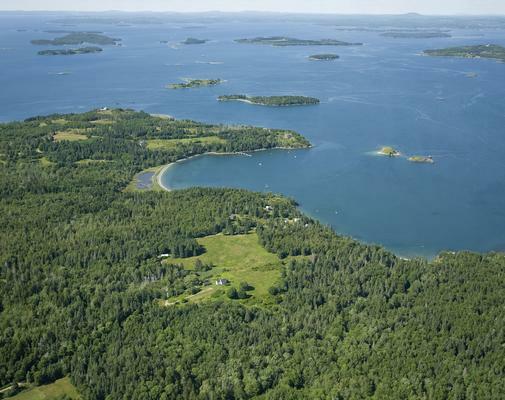 In short, a landscape that once evoked the best of Maine now increasingly evokes Scarsdale. Don’t get me wrong–I am far from against change. Nor am I even against grandeur, in its place–quite the opposite—I’m as happy as the next architectural tourist to visit Newport and imagine myself for a few minutes the grandson of robber barons rather than farmers and sea captains. No, what I’m against is banality, insensitivity, and pretension and cheapness. As I’ve said in a previous rant on the subject, If It Ain’t Broke, Don’t Fix It. And maybe I’ll be proven wrong—maybe this place will be purchased by some artistic soul who loves and understands it just as it is. And maybe Sarah Palin will go back to Alaska. I am currently unable to upload pictures from the new version of Blogger editor. The ‘help’ section, of course, is an oxymoron. Anybody else? Mmm…I can almost smell the salt air. So true – the runination of simplicity. There are basically too many of us on the planet now!Regarding the "if it ain't broke, don't fix it" maxim, this could easily apply to the changes Blogger has made to uploading photos. But just click on "Choose Files". They take a while (longer) to load IMO, and sometimes the picture appears before the grey "loading" button has completed along the bottom of the picture. But once it's framed in blue it's good to go. It goes beyond a disregard for "simple things". What's really lost is a sense of "place"~the gradual disappearance of buildings and landscapes indigenousto location. Most big houses look the same nowadays,variations on a theme of watered down grandeur. Thesameness is mind numbing, yet that is what's desiredby the majority, or so it would seem. The simple and plain mid-nineteenth century farmhouse with curtainless windows and painted floors that my family once owned sat alone, save for barns and outbuildings, on 40 acres an hour and a half outside of Washington D.C. That is, until my parents sold it to a man who then sold it to a developer who turned it in to a townhome (that's right, townhome) development for commuters to nearby Hagerstown, MD.And I believe Columnist is right as to how to upload photos, which I am able to do following a similar path. Although my personal motto is "too much is never enough" your words and pictures were truly inspiring (as usual).This particular scene brings to mind another of my mottos, which is quite appropriate here – "less is more, nothing being most"
I could not agree with you more on this one! First, that house is absolute perfection! Where's my trustfund when I need it?! (there's never going to be a trustfund) Like something from a Wyeth or Hopper painting.Second, I'm sure you can agree with me, but it drives me absolutely bonkers when people from out of state build these heinous monstrosities with 4 turrets and a yard of boueys, then go back to Jersey and leave them for us to glare at for the rest of the year! AGGHHH!! Where's a hurricane when you need it!? Those spare, elegant lines made all the more wonderful by that beautiful northern light. Sigh. I agree with all above. This beautiful piece of silent perfection should be worshiped. Suspect it will be bulldozed by the well meaning. Kinda' sums up my ideas of religion. I stopped breathing for a second when I saw this farm – we are losing ours too here in Nova Scotia, but at a slightly slower rate and at somewhat lower prices. No consolation however. If it ain't broke dont fix it,indeed!The capitol city of my province is losing it's scale and essence as a backwater 18th and 19th century colonial armed forces base, losing what is left of the two and three story Georgian and early victorian housing and commercial buildings to the god of real estate development.Here I sit in my 1820's unpainted and only slightly "improved" shingled cape house – when I'm gone it will be bulldozed and a McMansion built unless my grandson hangs on to it. 'We are dangerously without culture and that is why we are in the mess we are in, because no one is thinking' Vivienne Westwood.Does make one ponder the question of just how did this all start, and most importantly how to minimize it? Tax reform on farmland would be a great start. It is a pipe dream to think that anyone paying $1.8 million for this property will leave it as is. 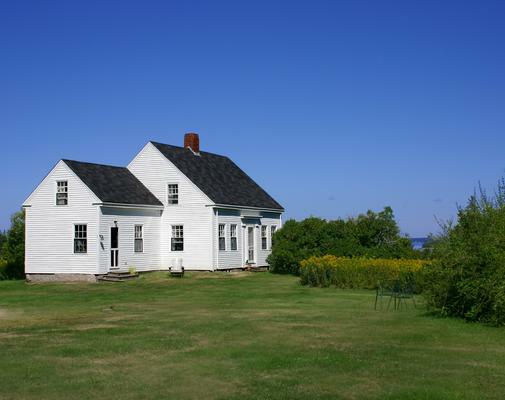 North Haven Conservation Partners, the excellent local land trust, could play a role in helping protect this property – keeping it a farm and limiting changes to the historic cape. Please support their efforts by contactig them today. It is true about agricultural taxing. It must help.I know nothing about taxes (Lordy!) But here in Santa Barbara some things are being saved from "mansionization " (I almost capitalized that!!! EEEEEK!!!!! )It all makes me sick. 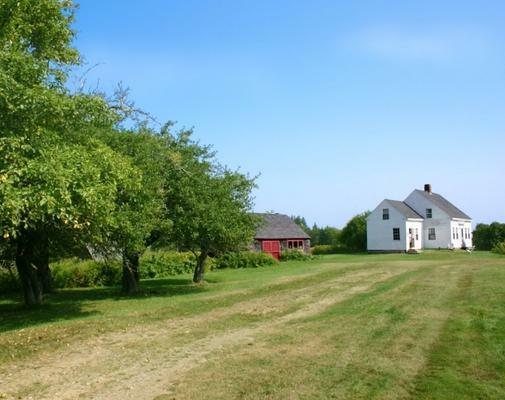 My wife and I bought this property, Eastern Bay Farm, a year ago. It is the closest thing to perfection we have ever found. Rest assured, we intend to preserve the land and the house essentially as is. The world may be a harsh place, and some things change and fade, but not everything does. This is quite a late comment on this post but I thought it might be of interest to anyone still reading that one of my family members purchased this farm. 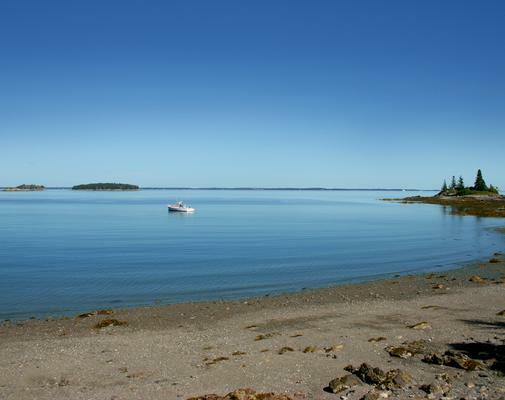 Growing up we spent some happy summers in Maine and the property is also very like the places we loved as kids. There are no plans that I know of to change the property in the way suggested- with a McMansion, bulldozers or otherwise. Indeed, the simplicity and charm of the property was one of the main selling points. I believe it needs some essential works to maintain it- for example, the roof- but nothing to alter the nature or character.